Can you tell me the total price plus shipping, with money exchange for “Heeling Is Just Another Trick”? Does any one in United States sell this DVD? Thanks, I have no idea if I can afford the money exchange. Heeling is my favorite thing. The exact amount varies from day to day, so best is to put “45 euros to dollars” in Google -- today it says 57 usd. You can as well get it through Clean Run and Dogwise. Je viens de passer commande pour le DVD Tricks et marche au pied en français, et je ne sais pas si ma commande a été validé et quel délai est nécessaire pour la réception du DVD. Yes, your order came though fine. You’ll get another note when the DVD is shipped -- normally Monday, so you should have it by the next weekend. 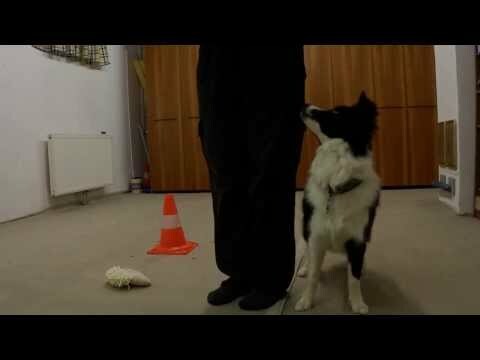 I just downloaded and watched this heeling video and have started practicing with my dogs. I did some work on rear end awareness on my young dog when she was a puppy so she is familiar with having her front feet up on a “pot”. My purpose for buying the dvd is for competition obedience heeling and I was wondering what your “cue” words were for left and right sided heeling. My girl knows that “heel” means find my left leg and “strut” is what I use for forward movement. Should it just be one word and which one do you think I should use for the left/right turning exercises on the raised object? Thanks, Happy New Year!!! I use two different cues for left and right heeling and use the same cue for either finding the position and for forward/back/side movement -- it always means to stay at the leg. I only introduce it once I put myself next to the target. For free pivoting, I don’t really have a cue -- you can use one, but not heeling cue, but something like pivot and reverse or something. Cool, just try to help with the hand less + for now make it all about the pivoting, adding more&more steps forward gradually to not lose the effect of pivoting that is constantly correcting the rear according to the leg to get the “glued to the leg” effect. You lost that effect somewhere on a way, so I would go back to more pivoting to get it back as at this point, it doesn’t show at all she knows the pivoting and targeting the leg… Remember that going slowly is always the fastest way to the goal in dog training! I have a question. Now she learns always to be and follow my knee. She sit down,when I stop. But she doen’t stay in this position. How can I learn her the diffrent? I just ordered the Heeling video. Is it clicker based training? I don’t use a clicker usually, just one more thing to lose so wondered if I could do this method without a clicker? Yes, it’s all clicker/shaping. If you use shaping, but not a clicker, that’s no problem, you’ll just use your marker word instead. However, if you don’t use shaping in fear of losing a clicker, then you should rethink that decision 🙂 -- as shaping opens sooo many options and is sooo much more as a little box called clicker! Clicker is just a tool, but shaping is a method that opens a whole new world to dog training, so definitely worth exploring! Tricks for a great bond explain more on shaping. That’s very strange… What program do you use to play it? Did you try VLC? My dog is almost 4 years old and I have taught her to balance on all different objects unfortunately that has caused me to run into some issues when trying to teach her to heel. She wants to put all four feet on the object. I spent one whole session only paying her when she only had two feet up. But I’m lost because now she won’t move her back feet at all except to put them onto the object so I’m not sure how I can help her to understand or when I should be paying her. I have just downloaded this video and watched it for the first time. Looks great. For step 1, how long do you recommend each session should take and how many times a day? Great! And well, that really depends on each dog a lot… My sessions with puppies are very short and frequent (4 times a day, per 5min) and my sessions with experienced dogs are less frequent and longer (max. 1 per day, per 15 min), BUT I never work on just one thing in the session, but vary it some to keep it more interesting.